Many years ago I published “The Complete Book on Takeout Doubles” and announced at this time that there would be a sequel which would discuss other doubles. It took seven years to get this done but here it is. 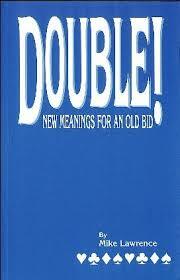 This book covers many meanings for double, some of which you probably know about, and quite a few that are new. Here is a partial list of what you will find in this book. Penalty Doubles. When to double for penalty. When to pull partner’s penalty double. What should it mean if you double a splinter bid? Can you use Lightner doubles against games and partscores? What does it mean if you double a Drury Bid? Some ways to streamline your Negative Doubles and your Responsive Doubles Judgment and a lot more. Really, there is something new for everyone in this book.